Woodard Audio started out selling do-it-yourself (DIY) loudspeaker kits, but they have recently begun selling their own line of finished speakers and subwoofers. They design all of the speaker systems that they sell, and will work with buyers to ensure that they purchase the speakers best suited for their spaces and applications. Woodards products are available only online, at their website, www.woodardaudio.com, and come with a good audition policy: If a customer decides that the speakers are not right, he or she can return them within 30 days for a refund or credit. The Woodard subwoofer I was sent for review was the Pro 12 Sport ($299 USD). As subwoofers go, the Pro 12 is on the small side: 18" high by 14" wide by 13" deep. In comparison, my Axiom Audio EP175 subwoofer is shorter (13.5"), but slightly deeper (14.25") and considerably wider (17.5"). In smaller spaces, those few inches can make the difference in being able to place a sub exactly where you want it to go. The Pro 12 weighs 40 pounds; while you wont want to be moving it around every day, its not as unwieldy as other subs Ive had. 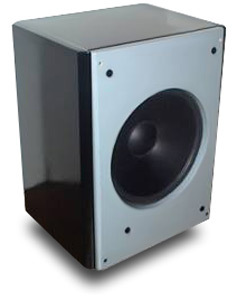 The Pro 12s enclosure is made of heavy MDF, and while the finishing job is adequate, the result is not the most attractive subwoofer Ive seen. The front is dull gray, mostly covered by a grille of black cloth. The sides, top, and rear are black, and there are places along the seams where better sanding or more careful gluing could have improved the subs appearance. This level of finish is acceptable for the Pro 12s cost, but it cant compete with the other two subs I had on hand, the Axiom EP175 and the PSB 6i Subsonic. The Pro 12s amplifier is rated at 110W into 8 ohms and has a frequency response of 30-180Hz. In comparison, the Axiom EP175 is rated at 175W and 32-150Hz, the PSB 6i at 225W and 29-150Hz. But the latter two subs are much more expensive than the Woodard: $530 and $699, respectively. The Pro 12 Sports rear-panel controls are laid out in an easy-to-use manner. On the top left are two switches, one above the other. The top one inverts phase, allowing the user to choose settings of 0 or 180 degrees. Changing the phase can help with subwoofer placement: the correct choice is the one that produces better bass response in your desired location. Under this is the power switch, which toggles among Off, Auto, and On settings. Set to Auto, the Pro 12 will turn itself on only when a musical signal is present. To the left of the power switch is an LED that lets you know if the power is on. I think it would have made more sense to place the power switch on top, but that may just be my personal preference. Next to these two switches are knobs for the crossover and output-level settings. The Crossover knob has only two labels, on the far left (40Hz) and far right (160Hz). It would have been helpful had there been more markings along the spectrum (both of my comparison subs have such markings). The Level knob, too, has two labels, Min and Max. Again, more markings along the spectrum would have been helpful in setting the subs level. Finally along this top row are two sets of female RCA jacks, for line-level input and output. Below this row are two sets of speaker connectors that can accept banana plugs, pins, or bare wire. The left-hand set is labeled Hi Level Out, the right Hi Level In. Below this is a heatsink that spans the control panel, and below that is a switch to set the subwoofer to 220-240V or 110-120V. Finally, there is a receptacle for a power cord; you can use the stock cord supplied with the sub, a fancy aftermarket cord, or simply a longer one if the sub position you choose requires one. The first thing the user needs to decide is whether to use the Pro 12 Sports line-level inputs or speaker connections. Using the line-level input requires that your preamp or integrated amp have a variable line-level output. If it does, then simply connect it to the Pro 12s line-level input and move on to the next stage of setup. If your amplifier lacks such an output, youll need to run one set of speaker cables from the amp to the subs Hi Level In inputs, and a second set from the Hi Level Out outputs to your speakers. This may be obvious to most readers, but the documentation I received with the Pro 12 didnt describe how to set up the Sport using the speaker connections. In two separate places it states that the line-level input is the preferred hookup, but never is the user told what to do if that is not possible. Once you have the Pro 12 connected to your electronics and placed where you want it to go, youll need to adjust the crossover and level. One way to get close to perfect placement for your sub is to place it where youll be sitting, then walk around the room listening for the best bass response. Once youve found that spot, place the sub there. Of course, this is not always practicable, so you may just want to start with the sub along the same wall as your speakers. Your main speakers will determine the crossover setting. The idea is to get the subwoofer to merge seamlessly with the speakers output so that all three units (two speakers and the sub) present one seamless aural picture. Youll want to set the crossover higher if your speakers frequency response doesnt extend too low. The Level adjustment sets the volume for the subwoofer; again, youre trying to match your speakers level so that the bass is not too loud or too soft to complete the sound. Shall we give a listen? I used the Pro 12 Sport in two systems with the same electronics -- a Rogue Audio Tempest integrated amplifier and a Denon DV-2900 universal audio/video player -- and different speakers: Quad 21Ls (35Hz-24kHz) and Axiom Audio M22tis (60Hz-22kHz). The cables were all Audience Conductor designs, except for a 20 Monster Cable subwoofer cable. The Pro 12s performance was, naturally, dependent on the speakers I paired it with. The Quad 21Ls seemed to strengthen the illusion of a real performance taking place in front of me, but this was not a dramatic change. Instead, the soundstage seemed subtly deeper. This intrigued me; it opened my mind to the idea of using a subwoofer in a two-channel system, even with main speakers that are nearly full-range. With the Axiom speakers, the insertion of the Pro 12 was much more noticeable -- it added considerable weight to the sound, and made recordings sound much more lifelike. If your speakers are full-range or nearly so, the addition of the Pro 12 might not make a night-and-day difference -- but the subs small size would nicely complement a pair of bookshelf speakers. The rest of this review describes my impressions of the Pro 12 Sport when paired with the Axiom speakers. Many people, I imagine, want a subwoofer so that they can enjoy music that makes prominent use of low frequencies, such as dance music or hip-hop. My first stop was at Jurassic 5s Power in Numbers [CD, Interscope 0694934482]. On such tracks as "Whats Golden," the Pro 12 Sport clearly pulled its own weight. Not only was the bass much deeper and fuller, but this added to the overall depth and realism of the presentation. My greatest concern in using a subwoofer is that it might bloat the bass and the music would thus lose definition. I worry that, instead of a changing bass line, a sub would present me with a deep, thunderous bump-bump-bump without definition. But listening to Bj�rks "Army of Me," from Post [CD, Elektra 61740-2], with the Pro 12 alleviated my concern: with the Woodard in the mix, the bass was not bloated, but focused and tight throughout the songs more complex bass passages. However, not everyone enjoys dance and pop music; keeping the bass tight and focused during more acoustic music might prove more difficult. To test the Pro 12s re-creation of symphonic music and acoustic jazz, I played the recent reissue of the Star Wars soundtrack [CD, Sony Classical S2K 92950] and The Great Jazz Trios Someday My Prince Will Come [Eighty-Eights/Columbia 092819]. My general impressions remained the same as with the pop and electronic music Id listened to earlier, but the Pro 12s contributions to acoustic jazz and orchestral music were much less visceral. It seemed to improve the imaging, thus making it easier to discern instrument placements, and it obviously deepened the bass, but that seemed less important with this music. With electronica and hip-hop I found the subwoofer an integral part of the listening; with acoustic music I was much less aware of the subs contributions, which I thought were not as essential for an enjoyable musical experience. Others may hear it differently. If bass is really important to you, then my observations about musical genres may not matter. The other subs I had on hand improved the music in similar ways, but the PSB 6i Subsonic was far and away the best of the three. Of course, to get the PSBs level of performance, youd need to spend more than twice the Woodards cost, and at 46 pounds and measuring 15" x 20" x 20", the PSB comes with considerable constraints in weight and bulk. However, its front-panel placement of the crossover and level controls makes it easier to set up (I didnt have to climb behind the sub or twist my neck to see just where the settings were). The differences between the Axiom and the Woodard were less noticeable at normal listening levels. At higher volumes, the Pro 12 seemed to lose some focus, but, again, the $231 price difference is considerable. If youre looking for a compact, inexpensive subwoofer, Woodards audition policy means it wont hurt to take a look at the Pro 12 Sport. The Woodard Audio Pro 12 Sport does what it was designed to do: provide an audio system with deep bass at a very reasonable price. Aesthetically, it cant compete with the Axiom or PSB subs I had on hand, and those models offered cleaner sound -- but theyre also much more expensive than the Woodard. Whether or not you want to add a subwoofer to your system will depend on what sort of music you listen to, and what is important to you in listening to it. The size of the Pro 12 Sport makes it ideal for small spaces, and its price makes it ideal for those on a tight budget. College students living in dorms or those who live in small apartments but seek deeper bass from their systems may want to take advantage of Woodards audition policy.